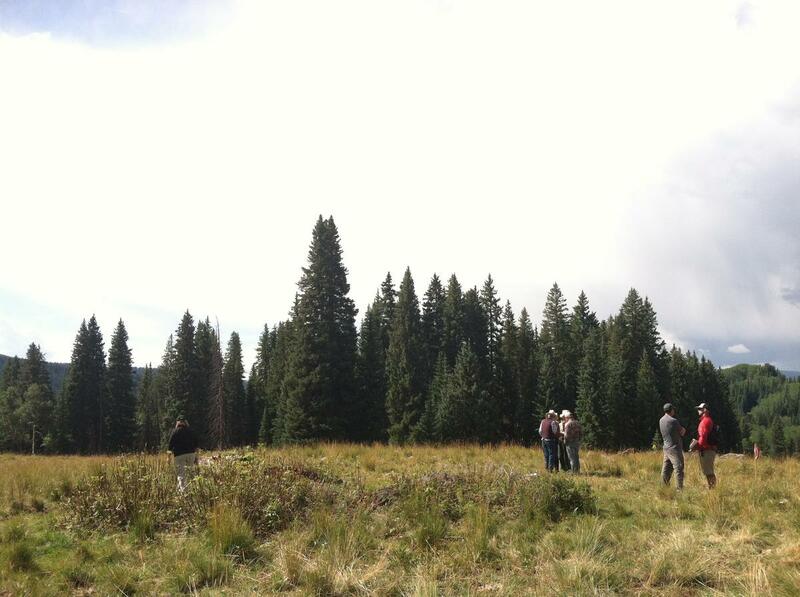 About 40 people gathered at a site visit by the Forest Service Tuesday. 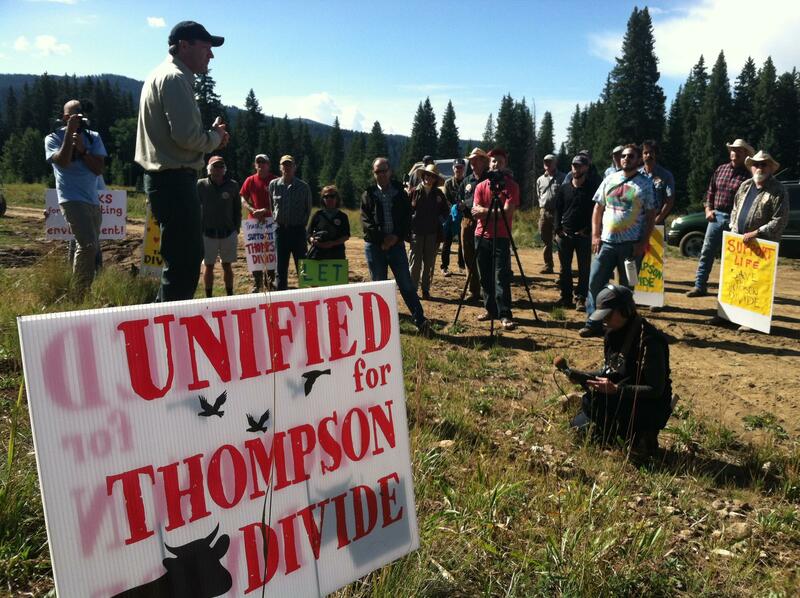 The agency is reviewing a proposal by an energy company to drill an exploratory well in the Thompson Divide. The Forest Service was met by protesters Tuesday (9/2/15) in a remote area in the Thompson Divide, southwest of Carbondale. The agency is starting a review of a proposal to drill an exploratory well. But, the group gathered doesn’t want any natural gas drilling. They say the area’s natural environment is too valuable. Aspen Public Radio’s Marci Krivonen reports. It’s tough to imagine coming up here for anything other than peaceful moments in the great outdoors. 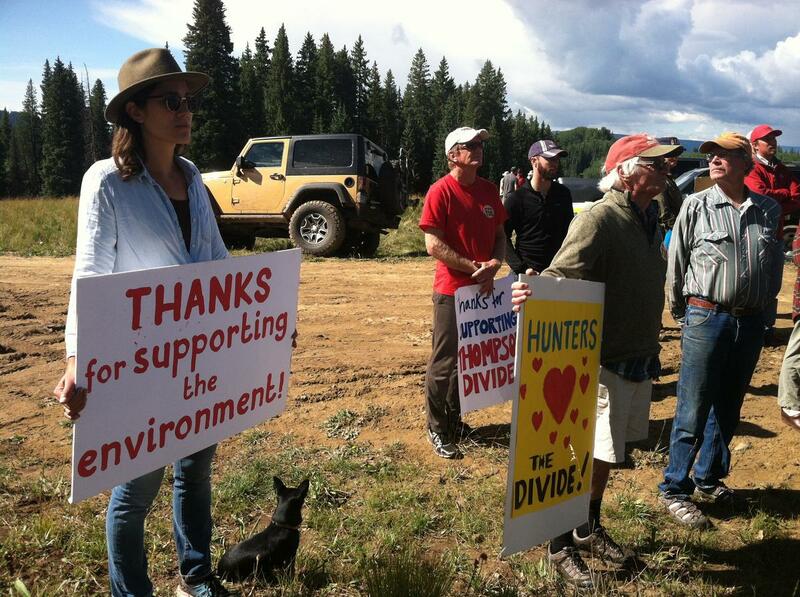 But about 40 people Tuesday maneuvered mud-caked roads to protest drilling. Some even slept over. Reporter: "You’re carrying a pillow. Did you camp?" Kessler: "We did. We camped out last night and enjoyed some time around the campfire." Protesters listen as White River National Forest Supervisor Scott Fitzwilliams explains what the agency's doing in the Thompson Divide. Zane Kessler is director of the Thompson Divide Coalition. He’s working to keep out energy development over the 220,000 acres that make up the Divide. "We have interests at stake, whether you’re a grazer, small business owner, a hiker or a mountain biker, everyone has skin in the game here," he says. The dispute over drilling here has been ongoing for years. Hunters, hikers, ranchers and others argue the area’s not suitable for wells and infrastructure. But, energy company SG Interests is taking first steps toward development. Scott Fitzwilliams is Forest Supervisor for the White River National Forest. "When a gas company files a notice of intent to stake a well, one of the first things we do is go up there with our specialists," he says. Today this four-acre patch of Forest Service land becomes a science lab. A team of hydrologists, biologists and landscape architects will comb the area to determine the best location for the proposed well. "Like all projects we have standards and guidelines to meet," says Fitzwilliams. "We have timing limitations with elk calving, we have visuals - all the things that will go into the determination of whether or not we will permit the well." Scientists comb the area where SG Interests wants to drill an exploratory well to determine how much natural gas is underground. Fitzwilliams believes the amount of disturbance will be small. Plus, it’s hard to tell, but this area isn’t untouched. There are ten wells nearby that mostly store natural gas. This well is different - it’s exploratory. It’s drilled to determine how much gas is underground. Robbie Guinn is Vice President of SG Interests. "It just lets us know whether we want to continue developing in this area and it tells us what kinds of capital investments we would want to make to start full development." The company would plunk down several millions of dollars for this well, alone. "We would like to find out whether we want to continue developing here. Development in this area would compliment the development we have further south," says Guinn. SG Interests has drilled three dozen wells in Gunnison and Delta counties. Back at the potential well site, scientists are looking over the land on one side of the road and protesters are gathered on the other. Bill Hunt lives in Aspen but spends a lot of time out here. "We ride horses, we walk, we have a cabin over at North Thompson Creek. And, we graze cattle there." He fears energy development here would affect his cattle operation. "We’d conceivably lose that income, and conceivably, we’d have water damage and conceivably, the air quality could go to hell for a fair amount of time." Ultimately its up to Fitzwilliams to decide this first step in a long process: whether to approve a Forest Service Use plan for the proposed exploratory well. "The first thing we’re going to do is make sure we consider all the environmental effects, what the issues are, what the public’s saying and make sure we disclose that information," he says. "After that, I’m going to rely on policy and process and the laws that govern oil and gas leasing." If he gives the green light, the proposal will go through a series of steps that include the Bureau of Land Management. A full environmental review would be launched and the public would get opportunities to comment. It could take up to three years before any exploration could happen.